Popular spiritual author Gary L. Thomas invites you to shake off the shackles of misunderstanding about sin and experience the liberating power of living a life of holy pleasure - a life that feeds your relationships, protects your spiritual integrity, and energizes your worship and service. Get ready to experience the freedom to feel good as you move forward in your faith. 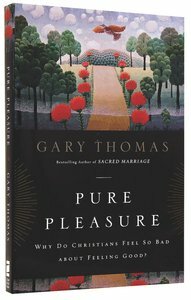 ^^^Gary Thomas, one of this generation's most popular and accessible writers about the spiritual life, explores what it means to build a life of true pleasure - one that will liberate the believer's spiritual life, marriage, family, Christian community, and outreach. ^ ^Many Christians assume "pleasure" and "sin" are synonymous. Others define godly pleasure so narrowly that they drastically minimize the powerful and holy role that pleasure can play in their lives. Still others feel guilty even thinking about how to build a life of pleasure. For all of them, Pure Pleasure provides an entirely new paradigm. It invites contemporary Christians to embrace a life of true pleasure as a pathway to obedience, worship, and service. ^ ^Building on his bestselling books Sacred Pathways, Sacred Marriage, and the Gold Medallion-winning Authentic Faith, Gary Thomas takes readers to a new level of faith by providing a theological and inspirational framework to help them cultivate the kind of life that pleases God. Abounding with spiritual insights and practical exercises, this book provides the freedom to approach life in Christ with new wonder and joy. Discover the power of guilt-free pleasure. Pleasure is a good thing. It's a powerful force that feeds your relationships, helps protect your spiritual integrity, and brings delight to our heavenly Father. Pleasure isn't something Christians should fear, shun, or disparage; it's something we should learn to cultivate in our lives. Acclaimed spiritual growth author Gary Thomas will guide you into this way of life, which is foundational to a healthy relationship with God, with your loved ones, and with the world. He'll show you that, for the redeemed, pleasure can be a powerful and holy force for good, leading to increased worship, spiritual strength, and renewed relationships. In this invigorating and liberating book, Gary Thomas will energize, inspire, equip, and challenge you to experience life as God meant it to be: overflowing with pleasure.